Ooooh, what do we have here?!?! 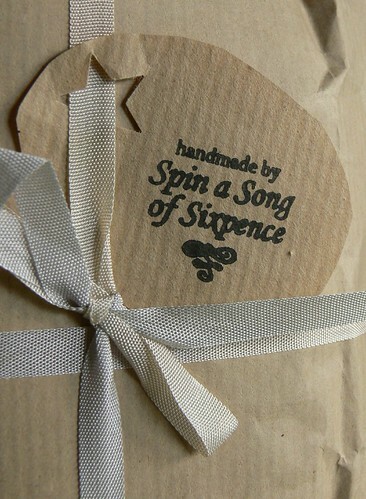 It's my beautifully wrapped and thoughtfully handmade goodie package, courtesy of Sian from Spin a Song of Sixpence. 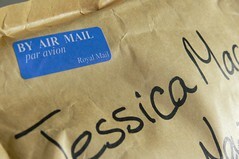 For no particular reason, Sian decided to do a giveaway on her blog, and lucky me, I was the WINNER!! 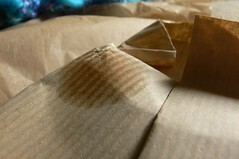 From the paper in which it was wrapped to the handmade tag, everything was presented perfectly. You couldn't tell how eager I was to open the packages because of the fact that I took way to many photos, that is, before the suspense actually got the best of me. But I wanted to pay as much attention to opening it, as Sian did to wrap it up. The culprit! It was melted.....but quick thinking prompted me to put it in the fridge to solidify again. Later that evening, I shared the bar with Cody. I don't know why I bothered to put it in the fridge, because it just melted in our mouths anyways! It was sooooo yummy! Although the above photo is of everything she sent in the packages, I received one with nothing but handmade goods, while the other donned items picked up locally - I presume. Upon first sight of the packages, I would not have guessed that they were packing so many goodies. I know they weren't, but I felt like every item was hand-picked especially for me! I loved each and every one of them. Even if I didn't quite know what they were........although, I suspect that the 'whirligig' (I named it that) is to clasp the electric blue wolly/scarf - handmade by Sian - together. Am I right? 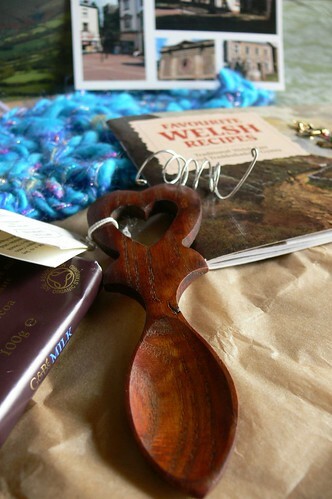 The custom of giving a love spoon is unique to Wales and originated in th 17th Century, when lovers would offer intricately carved spoons, bearing symbols of their feelings and hopes, to their partners. Today are given as gestures of friendship, engagement, wedding, and anniversary gift, and also make excellent reminders of a visit to Wales. I can't begin to tell you how delighted I was to find this goodie package in my box after a long day at work on Friday. Sian, thank you so very much for taking the time, and making the effort to brighten my day. It was a wonderful package with some truly unique items that I will cherish. THANK YOU! Recently, Sian started her very own Etsy store, an extension of her obsession, oops, I mean passion of all things having to do with yarn & spinning. Please have a looksy to see if she may have anything of interest to you. Yes, the items were all handmade or picked up locally and some were indeed picked with you in mind after my girls had pulled your name from the hat. I am delighted you like it my dear... and it gives me quite a kick to see Welsh goodies in your home. What wonderful things from Sian - lucky you! That chocolate is my favourite! Wow that is a great prize. I may have to beef mine up a bit now. I love the local touch she put into it. I can't wait to make something from the cookbook! and use my stencils!! Thanks again Sian......YOUR AWESOME! RR: That chocolate was delicious, my first time having some. I truly did feel lucky to receive the wonderful package! Greg: She really went all out, didn't she!? I really liked the local touch too, it was so very personal, which made it 100x's more special! jen: Why thank you, jen. That class sounds like a dream, I can't wait to see what you have to share! Packages are the best, especially when you don't know what will be in them! That was all so thoughtful. And I'm of the opinion that the best way to get to know someone is to read their blog. well done sian. i know it was fixed so i couldn't win.it's great she gave it to you J.M.but she could have given me a wooden spoon.but if she did she would make me pay for it.and it would have been a used one. what makes you think i'm sulking.kidding apart she put together a great welsh prize.enjoy Jessica and well done. I don't think anyone else could have done justice to the goodie bag half as well as you did! It was like being there, a totally enjoyable experience! Thanks to both of you for the smiles!! This was such a beautiful post! 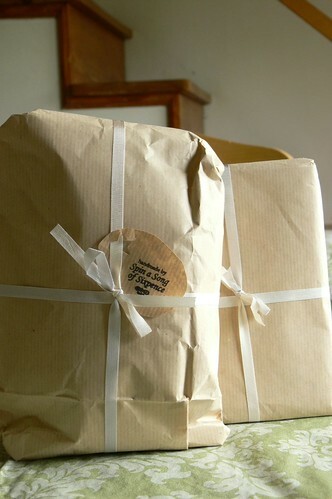 What lovely goodies (love the love spoon) but truly the wrapping impressed me the most. That, and the fact that you thought to get the photos of the unwrapped gifts. A treat to receive, and a treat to read about. carmen: I love surprises! That changed as I grew older :) I would have to agree with you, blogs are a great connection into the lives of others! lydia: I loved the wrapping too, I saved it....maybe I'll incorporate the items into an artcard?!?! 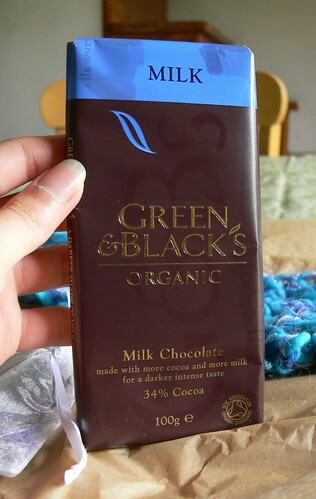 Mmmmmmmm Green & Blacks Chocolate... mmmmmm My favourite!!!! WOW! 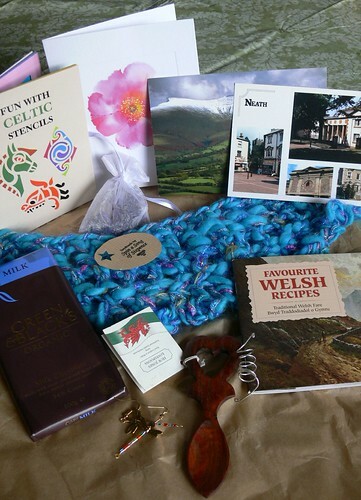 What a collection of goodies from the wonderful land of Wales. And I agree, the packaging looks wonderful! Sian really outdid herself with the packaging.